'It is impossible to fight our enemy with one hand and to fund it with the other,' Bennett fires, in criticism over Cairo talks. Economics Minister Naftali Bennett (Jewish Home) strongly opposes the push for Israel to agree to Hamas's economic demands, which would include paying the salaries of Hamas officials working against Israel politically and militarily in Gaza. 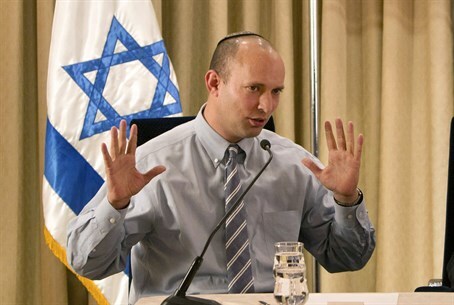 "Over the last day, reports have surfaced that Israel has agreed to finance Hamas's officials in Gaza," Bennett fired. "This is a dangerous euphemism. This is political protection money: you pay us, then we'll shoot you later; you don't pay us, then we'll shoot you right now." The money will inevitably go toward rebuilding terror tunnels, and manufacturing or importing missiles, Bennett said. "This is a formula of calm for cash," he continued. This way, he explained, "the State of Israel leaves Gaza with the continued strengthening of Hamas and damage to our deterrence. It is impossible to fight our enemy with one hand and to fund it with the other." Bennett also strongly rejected arguments that Hamas will not use the money for terror. "This is exactly the reason that Hamas insists on obtaining financing," he dismissed. Estimates that money is the prime factor behind Hamas's agreement to resume negotiations in Cairo last week persist amidst confusion over the talks' progress. On Sunday, the Palestinian news agency Sawa revealed that Hamas was able to funnel millions of dollars into Gaza over the past two months despite the IDF campaign - and that two months' salary was paid in full to its terror "military wing," the Al-Qassam Brigades, in the early hours of Sunday morning. Additional funds will also be paid to Hamas government officials. Analysts suspect that the funds - which seemingly appeared out of nowhere - may have been procured, at least in part, from Saudi and United Arab Emirates (UAE) donors. Palestinian Arab officials also claimed Sunday night that the Saudi funding is conditional on the promise that the funds will be used for legitimate civilian projects only - specifically barring the rebuilding of terror tunnels. It is unclear what system of checks and balances exist to ensure that promise is kept, however.